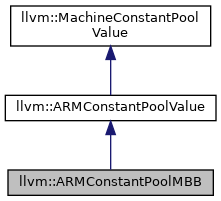 ARMConstantPoolMBB - ARM-specific constantpool value of a machine basic block. Definition at line 247 of file ARMConstantPoolValue.h. Definition at line 289 of file ARMConstantPoolValue.cpp. Definition at line 272 of file ARMConstantPoolValue.h. Definition at line 271 of file ARMConstantPoolValue.cpp. Definition at line 276 of file ARMConstantPoolValue.h. Definition at line 278 of file ARMConstantPoolValue.cpp. Definition at line 259 of file ARMConstantPoolValue.h. References llvm::HexagonISD::CP, llvm::RISCVFenceField::O, and print(). hasSameValue - Return true if this ARM constpool value can share the same constantpool entry as another ARM constpool value. Definition at line 283 of file ARMConstantPoolValue.cpp. Definition at line 294 of file ARMConstantPoolValue.cpp.